What is this tutorial about? Today I want to show how to setup a CDN for yourself to be independent from Blizzard. This is very usefull when you want to stick to a certan version of WoW. This tuorial is made for people that have basic skills in WoW-Modding and know some terms. For simplicity I will use Legion as my prime version. This works very similar to all versions that have a CASC storage. What is a CDN used for? As you may have noticed your Legion Client is able to load files not only via the BattlenetApp but also ingame. This is caused by a technology called CASC. A CASC is a special type of storage developed by Blizzard to be able to stream files to a game client. These CASC storage is provided via a CDN. Why have a own CDN? The anser is quite simple. Blizzard turns off support for older game versions. If you run a server and Blizzard shuts down their CDN for your client version it might stop working. To avoid this you need to have your own CDN. NOTE: You need Ribbit.net to use BuildBackup this is due to recent changes in the way Blizzard cdns work. You will need to use this aswell to downlaod from Blizzard cdns. You probably lack the batch but I will show you how to do this right now. There you will find a long list of different builds. Search for the correct one and get the Build Config (1. Hash) aswell as the CDN Config (2. Hash). Fill those in to get the right Version. Sadly alot of the older Versions are not available anymore. I cant provide those so back up your Version as long as it still exists! Now run the batch and wait for the process to finish. Your outcome should be a folder named tpr. Make a backup of this folder in case you mess up your working Version. Keep in mind this can be around 200 GB of data. Click the following 2 links and keep the Files where you can find them. We will need them in a minute. These files direct your client to downlaod the correct Version of the Game from your CDN instead of the oficial ones. You need to modify those later. Now you have to open your web-Server. This is needed becasue your Client uses HTTP to request its Files. (Note this will only work for WoD and Legion since they introduced a new Type in BFA). Setup the following folders in your Root folder. In case of Apache 2.4 this folder is called htdocs. Copy your CDN-Files from step 1 in place of the trp folder and your files from step 2 in your wow folder. 4. Step editing the wow-folder files. Of course you should use the web-server adress you have. To set it up locally you can use localhost. You can also use a diffrent port. If you do simply add the port behind both localhost. I use default 80. Fill in the hashes you used to download the files in step 1 aswell as the correct Version. Now you are nearly good to play. 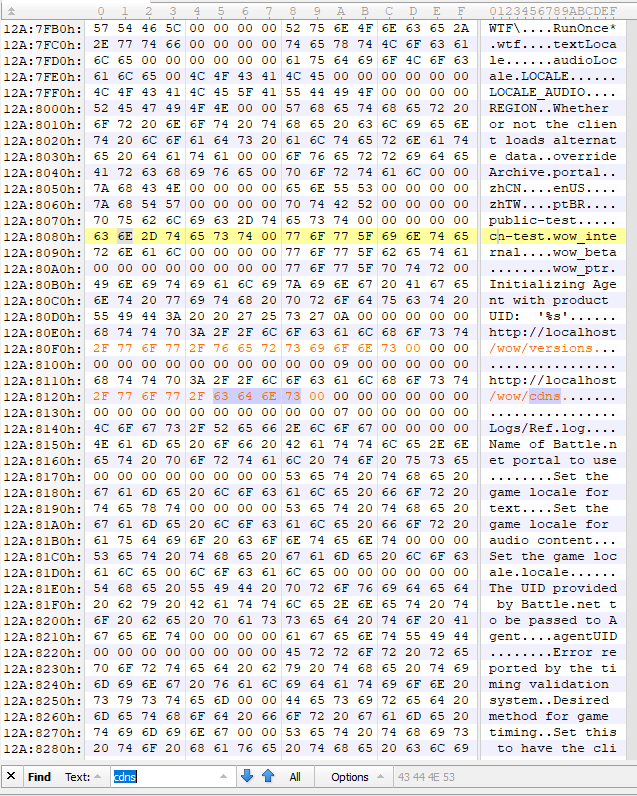 The URL to the Blizzard CDN is hardcoded in the client so you need a hex-editor to change this. Open your WoW-exectuable with 010 Editor and hit "ctrl + F". A small search bar apears at the bottom. Select the option text and search for cdns. You will find 2 links pointing to a Blizzard CDN. Simply change those URL's to point to your Web-Server and save the Files. Now you can Login to your Client and use your own custom CDN as long as your Web-Server is running! PS: In a future tutorial I will show how to add custom content to this CDN like your own maps and other changes! Feel free to comment! Thanks for the hint. I updated the tutorial. World of Warcraft, Battle.net and others are registered trademarks of Blizzard Entertainment and/or other respective owners. This site is not affiliated with Blizzard Entertainment and is purely for artistic and educational purposes.